As my oldest two children have been off rockin’ their first years of college out in Nashville, I’ve talked to them more regularly (and intimately) and have literally seen more of what goes on in their lives than when we were all under the same roof thanks to texting, Snapchat, Instagram and video chat. We even have our own private family Facebook group on which they occasionally post to humor their old mom and dad.So you can imagine my delight yesterday morning being able to video chat with my daughter who is half way around the world studying abroad in Israel, Turkey and Greece.I knew she was headed for a monumental broadening of her perception, and I was even pretty sure at what point it would happen. What I didn’t expect was the gift of being right there with her in it as it happened. Thank you, technology, for allowing me to be with my girl as she processed an intense spiritual/life epiphany…and thank you, God, for a daughter who wanted/needed her mother to be with her in that moment. Us Dickensons are weird like that. We dig the profound and personal and often turn to each other when the rest of life seems determined to stay solidly entrenched in the cheap and artificial. That’s how we’ve always functioned and survived as a family of faith in ministry. When my daugher’s lovely face magically appeared on the device I held in my hand (seriously people, where is my flying car? ), it was instantly obvious to me as her mother; she was diving deep into something that was going to take some work to be able to articulate. Kathryn went on to say how much she loved her new friends and traveling companions, the leaders and the tour guides and what a great time she was having…but…she was realizing an accelerated shift in her understanding was happening and she would never again be the same from this point going forward. “Aaaaaand…I have to somehow write my experience down in this.” she said as she held up the daily journal the students are required to write in for the course. I smiled and nodded and gave her the space to try and verbalize it. The first few days had been spent hitting all the main touristy “holy” sites. Though it’s absolutely impossible to say with any certainty, here’s where Jesus may have actually walked. Here’s the spot where St. Peter may have lived. Here’s the spot where Jesus may have performed such and such a miracle. Here is the traditional spot where it’s said the angel Gabriel visited the virgin Mary. What is certain is that there are ornate churches and gift shops built on each and every one of those traditional sites that are a source of major tourism revenue for the country. You can eat what Jesus probably ate, buy souvenirs made from the wood from the types of trees Jesus talked about and vials of Jordan river water and anointing oils to bring back home and pour over the heads of the devout as a special blessing (i.e. God will surely answer our prayers because we’re using authentic Holy Land bling). Jesus, the tourist attraction, is very, very popular and lucrative. 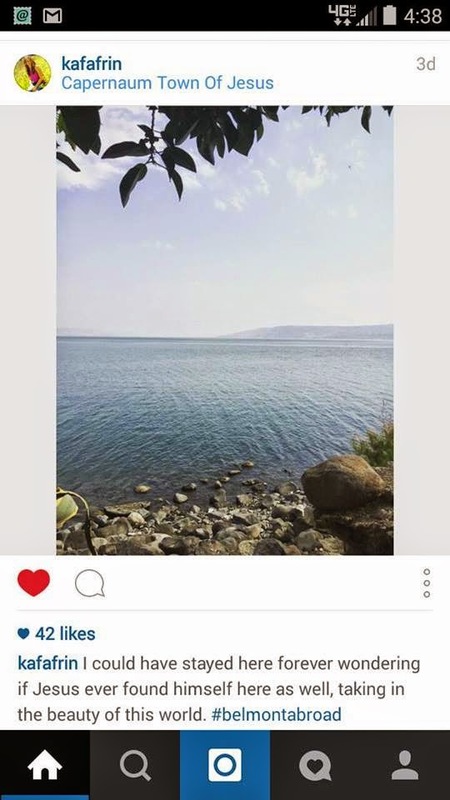 It was while visiting the Jordan River that Kathryn really wrestled. 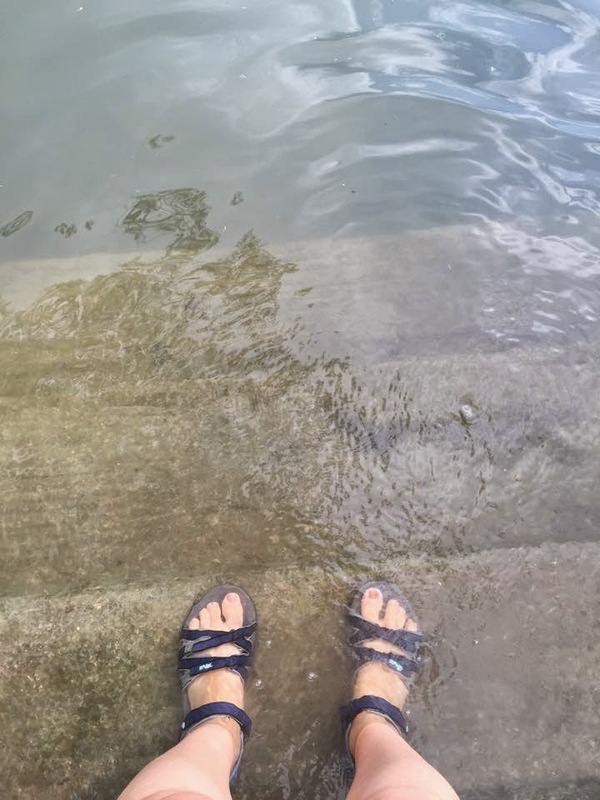 There’s a traditional baptismal site complete with steps and guardrails where annually thousands of Christian pilgrims go to be immersed in the same waters in which Jesus was baptized. Though many of her companions took the plunge, Kathryn ultimately opted not to. She did post this pic though which clued me in to what she was thinking and feeling even before she called to talk to me. *fist pump* THAT’S OUR GIRL! 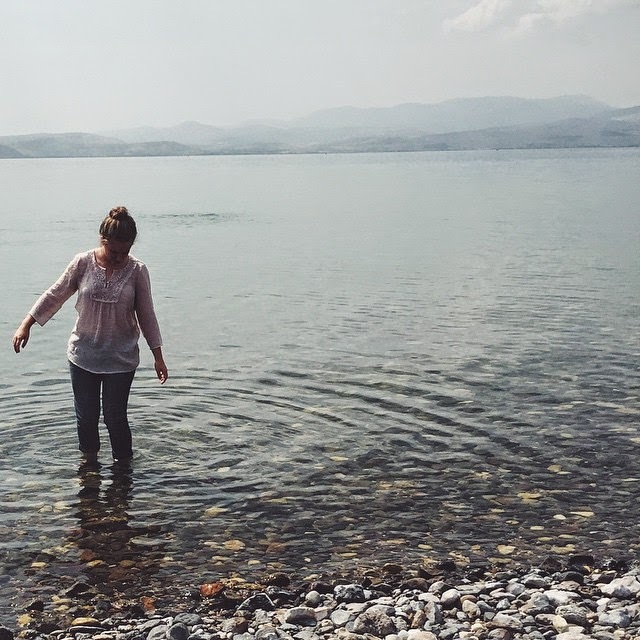 Where she did find spiritual and even a physical connection to Jesus via her 5 senses was away from the crowds and the tradition in a quiet and pristine spot on the banks of the Sea of Galilee in Capernaum. In all likelihood, Kathryn was indeed seeing what Jesus saw as she participated in his regular practice of retreating in silence and solitude in an area where he was known to have spent a lot of time building significant relationships. What would Jesus see?…or more accurately, but doing away with the WWJ (and can we agree that just needs to die anyway?) – HOW would Jesus see the world, my world, my experiences, my life right now? What would his take be on the relationships in my family? What would his attitude be towards the myriad of interconnected and clashing cultures and their politics today? What would his attitude be toward my neighbor? What would his attitude be toward my enemy? Who would he see as “the least of these” today? What would Jesus think about the booming tourism business bearing his name? What would Jesus think about the church and modern religious traditions also bearing his name? How would Jesus see the present Israeli/Palestinian conflict? Kathryn was fully aware she’d been born and raised within an American Christianity bubble, and she knew it was going to burst in cataclysmic fashion on this trip. 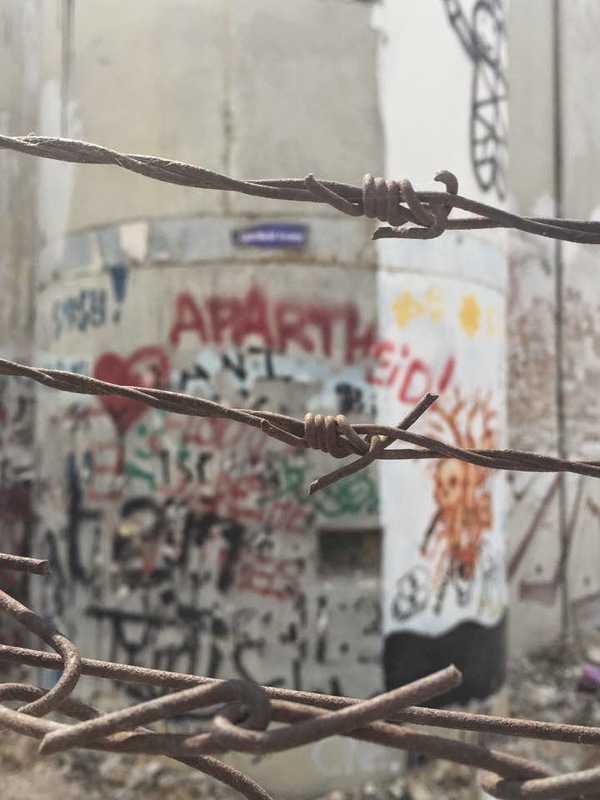 I not only knew it would happen, but upon looking at the trip itinerary, I knew exactly when – day 5, when they would cross the security border into the Palestinian-controlled West Bank. Oh sure, there was yet another “traditional” site to visit in Bethlehem, the Church of the Nativity, that was absolutely not maybe the exact location of Jesus’ birth. Ornate church – check. Gift shop with an assortment of Virgin Mary and sweet baby Jesus tchotchkes –check. But that certainly wasn’t the part of day 5 that rocked my girl’s world into another dimension. No. All it took was to simply cross the checkpoint. Once you cross over to the other side of the wall, all the preconceived notions and indoctrination from your American Evangelical Christian culture about “those people” and what they believe and represent evaporates as does whatever narrative you’ve been led to believe from the American media. Gut wrenchingly beautiful, heartbreaking, joyful, impossible, inspiring, frustrating beyond all description, hopeful beyond all description. What was being birthed in her that day was unadulterated and unencumbered compassion…she was seeing exactly as Jesus does. This was a baptism of Spirit that a dunk in the Jordan couldn’t have begun to touch. “Mom, I knew I was going to be changed on this trip. I knew being exposed to other cultures and seeing things for myself outside of books and what others have told me was going to expand my perceptions…but…but…” She trailed off not being able to find adequate words. And what exactly was responsible for such radical transformation and epiphany? Seeing and hearing people and their reality and touching it for herself. That’s entirely it. Their stories, their experiences, their families, their hopes, their dreams, their despair, their fears, their anger, their joy, their culture and individual expression. Holy crap! (surely that too must be for sale, if you find it, Kafafrin, you know I want need). Contrary to everything she’d been led to believe, Kathryn found Jesus hanging out on the Palestinian side of the graffiti-plastered barrier. Who woulda thunk it? (well, besides me…I totally called it). Oh it most certainly is…every bit as much as when Jesus walked in all those places where you are now. You, my girl, are truly seeing. Now to start walking into those undesirable places where you see love leads…into messy lives, holding nothing of yourself back, with no personal agenda or expectation…only open invitation. Love leads you to simply BE Jesus in the moment in connection with other broken humans, shedding the indoctrination and tradition in order to see them (and very much yourself) as Jesus sees. I thought I couldn’t be any more proud of this woman or marvel any deeper that I had anything to do with her being in this world. Now I know better. I will never cease to be amazed, inspired, and encouraged by her. The only thing I will ever want for any of my children is for them to have eyes to see and ears to hear and the courage to follow where love leads. Falling on my face tonight in tears and awe that I got to “see” her baptism live from Israel.